On our second day in Cologne we focused on its Jewish history. 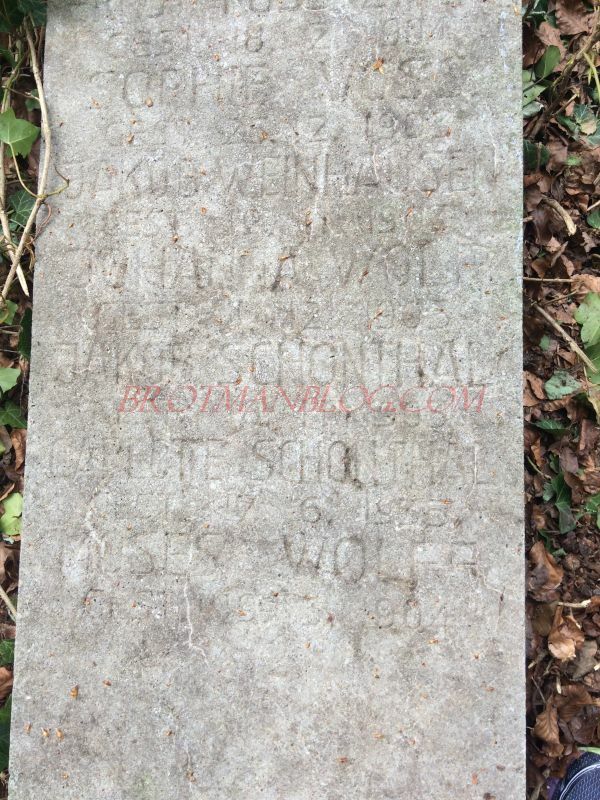 Back in December 2015, I had contacted Barbara Becker-Jakli to help me find where my great-great-uncle Jakob Schoenthal and his wife Charlotte Lilienfeld were buried in Cologne; Barbara had been extremely helpful, so a year later while planning our trip, I contacted her again, asking if she knew someone who would show us the cemetery and other Jewish sites in Cologne. She recommended Aaron Knappstein, who worked with her at the National Socialism Documentation Center in Cologne. Aaron and I had been in touch numerous times for almost eight months before the trip, and as I wrote here, he had located documents about my Nussbaum ancestors that I had given up ever finding (and they did not even live in Cologne, but in Schopfloch) as well as birth records for four of the five children of Jakob and Charlotte Schoenthal. So I was looking forward to meeting him and spending the day with him. Aaron did not disappoint us. 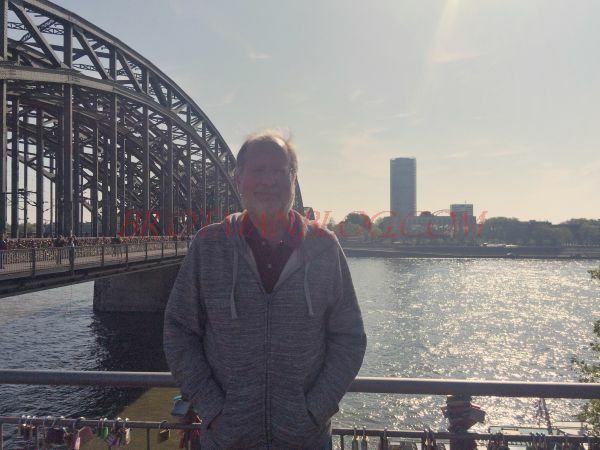 He is a thoughtful and knowledgeable man whose own background as the son of a Holocaust survivor gives him an interesting perspective on the Jewish history of Cologne. It was a moving and very informative day. He first took us to the Dom, which may seem a strange choice, but he wanted us to see the gargoyle of a pig being suckled—an anti-Semitic image once used widely. He also pointed out a Holocaust memorial that we had passed the day before without knowing what it was. It is not marked at all. 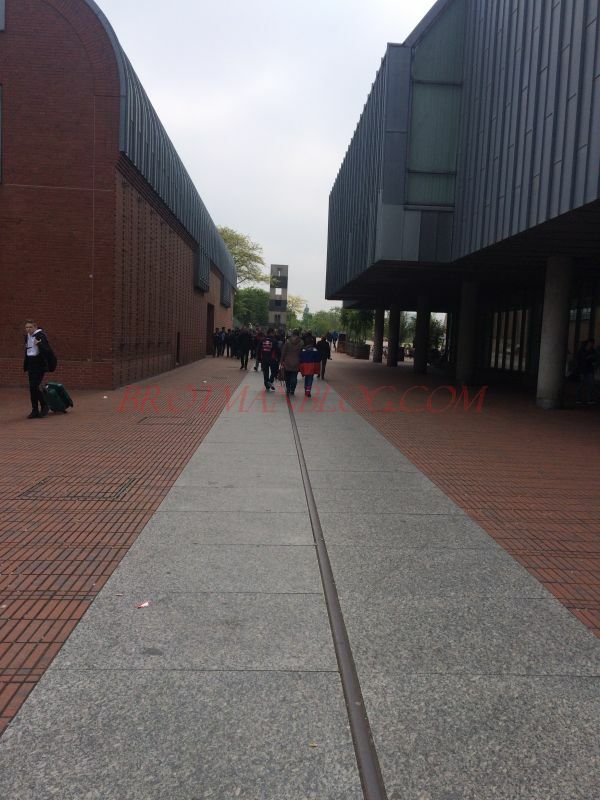 It is simply a long train rail placed on the ground running to the east with a six-segmented sculpture at its end. The sculpture is meant to evoke the six million killed by the Nazis and the gate to the camps, and the train rail evokes the trains used to deport the Jews to the concentration camps in the east. It was very powerful. We just didn’t understand why there was no marker or plaque explaining or identifying what it was. After coming home, I searched for more information about this sculpture and found this very detailed description and analysis on a blog called Tapfer im Nirgendwo, which means Brave in Nowhere. I didn’t read the other posts in the blog as they are in German, but this one was written in English. Apparently the rail and sculpture we saw are part of a larger installation by an Israeli artist Dani Karavan (I am sure Aaron mentioned the artist’s name, but it slipped my mind). The description of the overall work is fascinating and very powerful. We then walked to the location of the old Jewish Quarter where today there are plans to build a Jewish museum in the heart of the center of the city. Right now it is little more than an excavation site, and many relics of medieval times have been discovered. 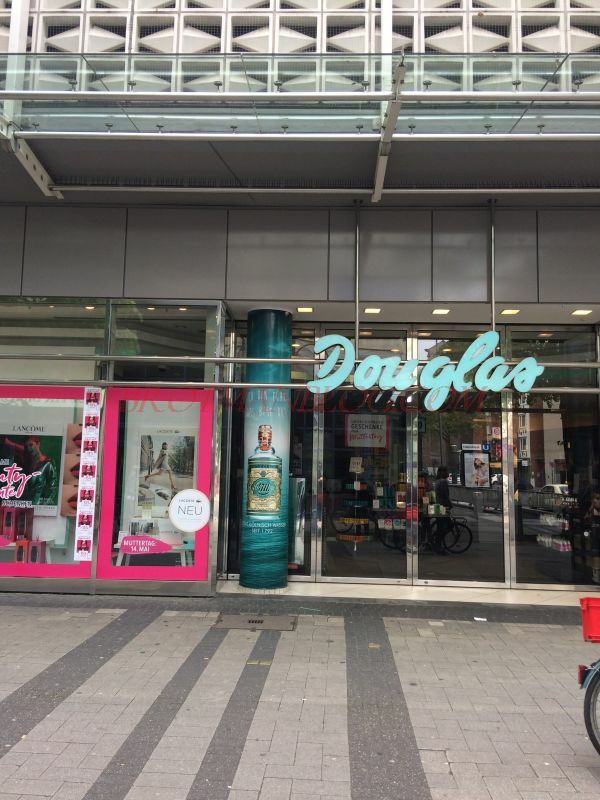 The Jews have a very long history in Cologne. As early as the 4th century, there was a Jewish community in Cologne; as in other places, there were good periods and bad periods for the Jews in medieval times. Some archbishops protected the Jews, others did not. The Crusades and the Black Death resulted in the deaths of many of the Jews in Cologne, and synagogues were built, destroyed, and rebuilt. Finally, Jews were expelled in 1424 because of a fight between the civil government and the Church regarding money and the payment of the taxes that were levied on the Jews. Jews were not allowed to return to the city until Napoleon’s time in 1798. Even then, they had to live across the Rhine in Deutz, although they were allowed to work on the other side of the river. We then crossed the river ourselves and went to the cemetery in Deutz where Jakob Schoenthal and his wife Charlotte Lilienfeld are buried. Jakob Schoenthal was my great-grandfather Isidore’s brother. As I wrote about here, he was one of only two of the ten Schoenthal siblings who did not emigrate from Germany. At the cemetery we met Herr Gunther, who once was responsible for overseeing the care and condition of this very large cemetery; there are over 6000 stones at the Deutz cemetery. 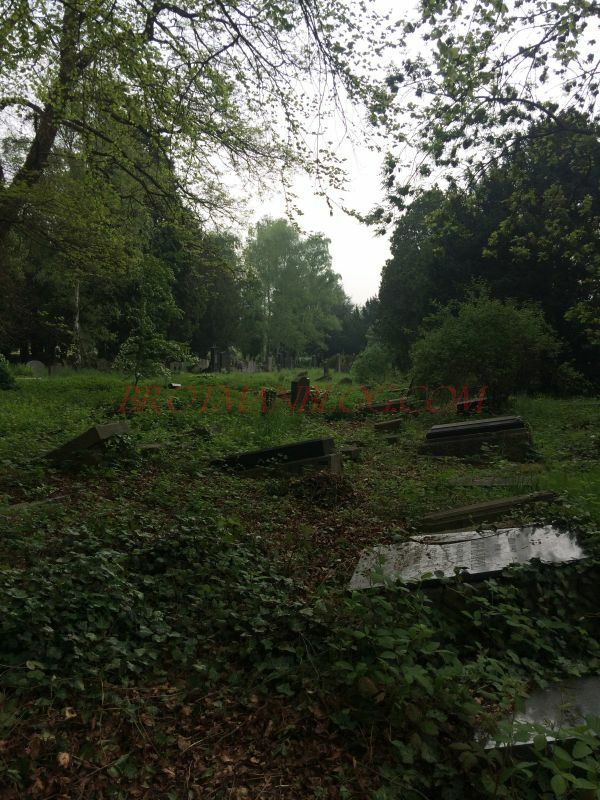 The original stones for Jakob and Charlotte no longer exist, but the cemetery knew where they were buried, and the Jewish community of Cologne paid to put new markers at the gravesites. I was touched and very appreciative of what they had done to preserve the memory of my relatives. 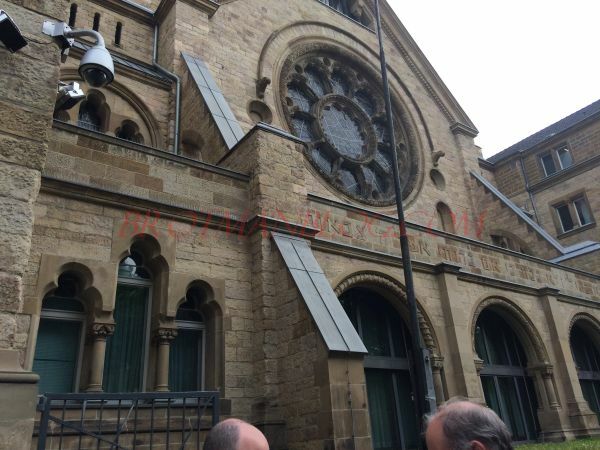 We then visited the one remaining pre-World War II synagogue still standing in Cologne, the Roonstrasse Synagogue. In 1933, there were approximately 20,000 Jews living in Cologne. Before the war there had been seven synagogues (although this source says there were only four), but all were damaged or destroyed on Kristallnacht, and only the one on Roonstrasse remains. 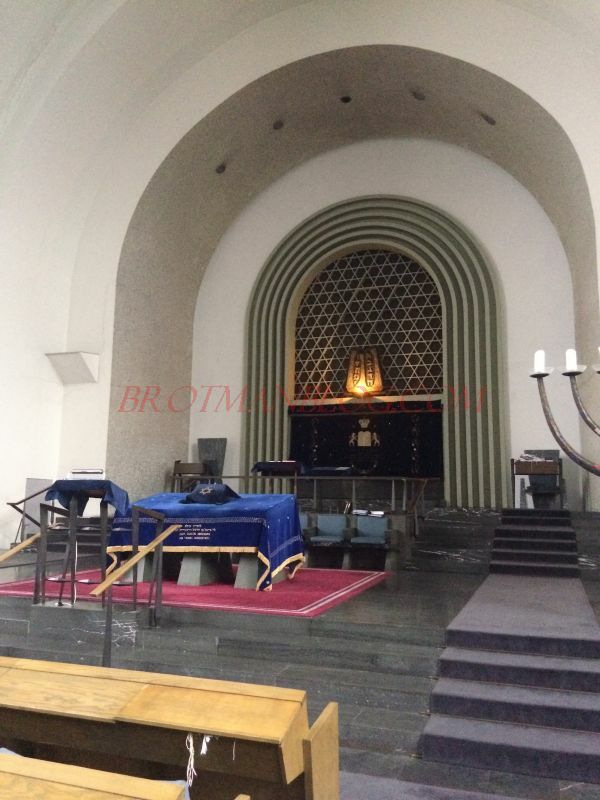 And it is still used as a synagogue; Herr Gunther is a member there and provided us with a tour. Although the exterior of the building survived more or less intact, the interior of the synagogue was, like the other synagogues, destroyed on Kristallnacht. During the 1950s, the interior was restored—not to its original style, but with more of a mid-century modern feel. Whatever the décor, it was very uplifting to know that there is once again a Jewish community in Cologne. Today there are about 5000 Jews living in the city. 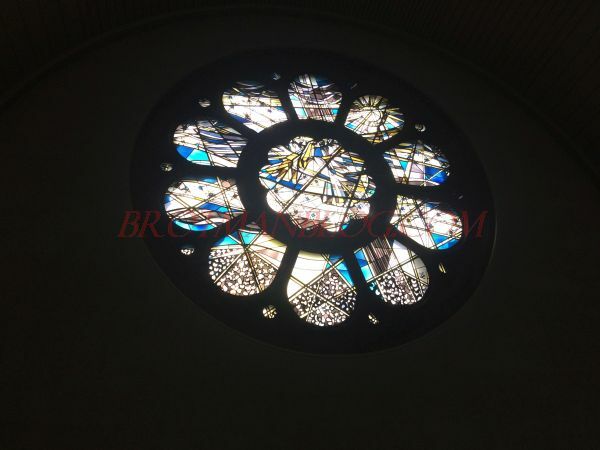 One of the stained glass windows installed in the 1950s depicts a dove to represent that the flood was over and that life was to begin again. I very much wanted to see the place where Jakob Schoenthal and his family had lived and worked—65 Breite Strasse. Jakob and Charlotte had five children. Four of those children survived the Holocaust—Johanna, Lee, Meyer, and Erna. As I wrote here, here, and here, Lee and Meyer had come to Pennsylvania early in the 20th century. Erna and her son came in the 1930s, and Johanna and her husband came after the war, having been deported to France where they were incarcerated at the Gurs camp. 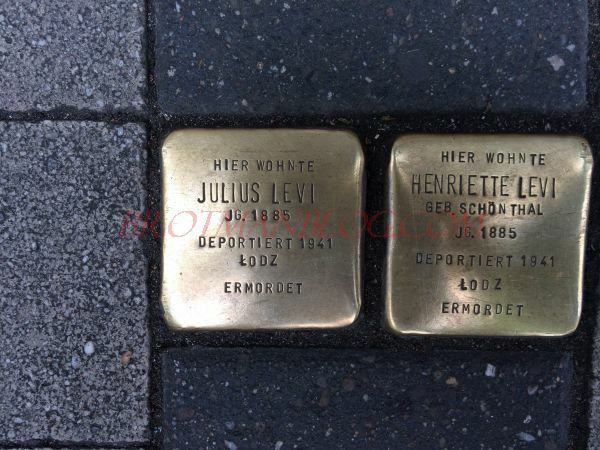 But the fifth child, Henriette, and her husband Julius Levi, had stayed in Cologne and had been deported to Lodz and then to the death camp at Chelmno, where they were killed. The location of the Schoenthal’s home and business at 65 Breite Strasse is marked by Stolpersteine for Henriette and Julius. Sadly, the buildings on the street were all destroyed during the war, but I took a photograph of the building that stands at that address today. I also took a picture of a block of older buildings nearby that had survived the bombing so I could imagine what the Schoenthal home might have looked like. That’s Aaron, our guide, in that second photo. Our final stop with Aaron was the National Socialism Documentation Center, where Aaron and I first spent some time trying to find records for a woman who was somehow related to my family. After some research we concluded that she was related to me through Jakob Schoenthal’s marriage to Charlotte Lilienfeld. More on that at some later time. Aaron then left us to explore the basement of the National Socialism Documentation Center on our own. The building that houses this organization had been Gestapo headquarters in Cologne during the war. The basement was used as a place to imprison and torture prisoners. Jews were not sent here, but some dissidents or those accused of being dissidents were. There are hundreds of written messages all over the walls of the cells; they are angry, frightened, passionate, and heart-breaking. Hundreds of people were shot in the courtyard of the building. Some people were imprisoned only briefly, others for quite extended times. The cells have been left untouched—the inscriptions remain to be seen. It was a dark and depressing place for us to visit, but an important one. We made a short stop at the Cologne city museum and then walked toward the Dom to return to our hotel. We decided to skip Italian food that night and had Lebanese food near the Rhine at a restaurant called Beirut. It was a welcome change and quite good. 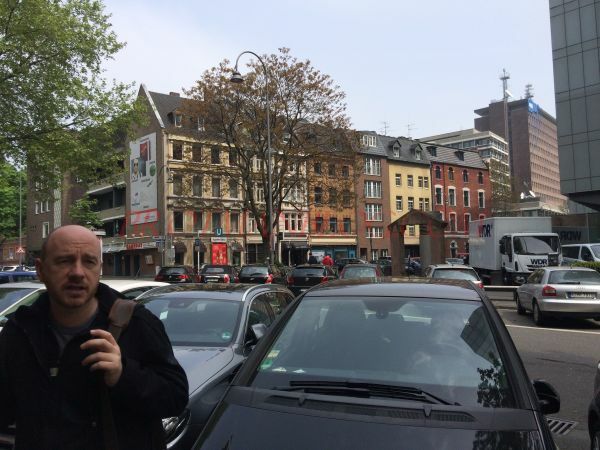 The next morning we would leave Cologne to travel east to the Hessen region where my father’s maternal relatives came from—the Schoenthal, Hamberg, Goldschmidt, and Katzenstein families. Cologne was the only major city we visited during our trip to Germany. It is a fascinating city with a long and interesting history and a diverse and rich culture. It is a reminder not only of the destructive forces of war and the human capacity for evil but also of our capacity for good. People rebuilt Cologne into a city that now provides hope that human beings can be creative, inspirational, reflective, tolerant, and kind. 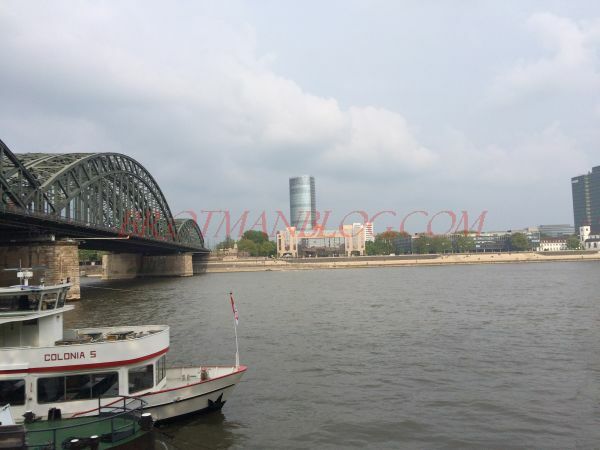 This entry was posted in Genealogy, Germany trip 2017, Holocaust, Schoenthal, Travel and tagged Cologne, Germany, holocaust, Koln, schoenthal, Travel by Amy. Bookmark the permalink. Amy… it was so wonderful to get to know you. Thanks for meeting me in Cologne ! And if anybody of your friends need help in finding information about their german family – contact me. 🙂 aaron.knappstein@stadt-koeln.de ! Of course, I will definitely refer them to you! Much thanks for a great day, Aaron! And let me know if you ever hear from Hannelore or her family. It is hard to imagine you were able to see all of these sights in one day. Thank you for sharing. We started early and ended late…. …as long as you didn’t fall asleep during dinner. Nah, too much adrenaline. We were tired though! You do such a wonderful job of telling the story – I feel like I was right there with you. The description of the Documentation Center brought chills to my spine. I can’t imagine your feelings as you visited. Thank you, Debi. It was very, very disturbing. 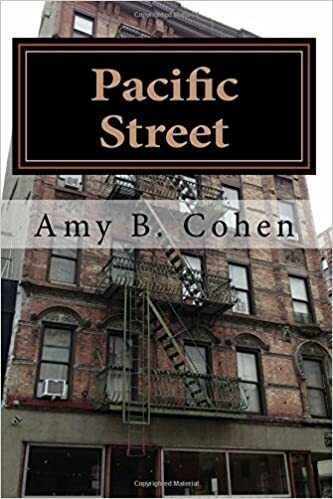 Amy, it’s possible the Holocaust memorial is not marked to force people to realize how the anti-Semitism of that era was as common and ordinary as a train track running through the city. There was fear all around and people were paralyzed by it. Or else mindlessly swept away in a way that will always be so strange to me and frightening. By not defining what the tracks are it forces one to inquire and seek out the answers. Not expecting what their purpose was brings a shock to the unknowing. It’s a good shock because it helps one realize the horror that once co-existed with daily life there. That’s my take. I know I’d be upset upon finding out and then forced to analyze my response and make sense of it. That’s a really helpful way of looking at it, Emily. Although I have no idea what the artist’s intentions were, it could be what he was thinking. On the other hand, that track is almost unnoticeable, and we had walked there the day before without seeing it at all. I agree with you. The artists intentions are not easily understood. Have you searched for any interviews with the artist? I feel others who are familiar with this have asked the same questions during interviews. The best explanation I found was in the blog that I linked to in the post. I will have to see if I can find anything else. I will try to check the link at another time. It has been a very hectic day. Have a good evening. Amy, I can’t sleep so I went to the posting you mention and provided a link to. It’s hard for me to get so in-depth as my daily life is such a scramble from one thing to a next. Hence I’m caught in a web of perceptions and views that are more from habit than any serious analysis and consideration. The posting is well written and the thoughts flow from one to the next. At the end I agree with the quote from Karvan. He says the artwork can evoke images and associations even he did not intend. I think that is true. If any artwork can shake up our way of looking of things and initiate a conversation it is doing a good job. Look at the responses coming up now. I think it’s good when we pause and go beyond the usual way of considering what the artwork evokes in us. Yes, art often takes us places that the artists themselves never intended. That’s the beauty of art and the beauty of the human mind. And to add to it intelligent conversation heightens the experience, like the one we’re having here. I am impressed with the plaques where Henriette and her husband lived.I wonder how often that has been done. I like EmilyAnn’s conjecture on why the memorial isn’t marked. I’m not sure I like a memorial that people walk on. I like the idea of it a lot and in part for the reason she mentions, but in practical terms I don’t like it. I either didn’t know that or had forgotten like most of my knowledge. Wow, thank you for sharing the info! I know exactly what you mean. I have forgotten most of what I know! I had a similar reaction, Luanne, the first time I saw the plaques. I think my own reaction comes from conditioning. We are used to seeing memorial plaques placed at eye level in a wall or upright structure. One thing I learned about Stolpersteine is that the artists’ thought was that he wanted people to bend over to read the names as a way of paying tribute—like bowing. But there were times it felt wrong to see people walking over them without noticing. Some people do object to their placement on the ground. Thanks for filling me in, Amy. I agree with Luanne and you, it feels wrong to me. I don’t feel it’s wrong—I have mixed feelings. I do like the idea that we have to bend down to read the names and thus bow in respect. Amy, I realized that in a way this is like certain memorial parks where the resting places are required to have plaques on level with the ground. Pinelawn in Long Island is like that. There aren’t any headstones. When I go to visit Mom I have to bow down to see the plaque. Eventually I sit on the ground, under the tree, and recollect time past and times to come. Between you and Luanne I’ve enjoyed the exchange and learned from it. Yes, and you know how dirty the ground gets with chewing gum and dirt and all. I thought of it from seeing those people walking along that train track that is in the ground. It’s a tough one for me more because I think most people don’t even notice it’s there. It is worthwhile to search for his “monuments” both in Israel and in Germany. Thank you, Dorothee. I will do that. Amy, Once again, you have brought tears to my eyes. Your restrained accounting of 20th century’s horror and the memories that persist are as moving as if I had been there. Daddy. Thank you, Amberly. Your comments mean a lot, and I am so glad that you are reading along with me as I remember the trip.